SPG Infotech is run by experts in the field of information and technology. These professionals are not only very successful in their area of work but work with a similar intention to give their best to the customers. The people working here have intentions of taking the Indian IT business to foreign countries for better results. SPG does not consider the size of their customers important and pay the same attention to every job. In order to run a business properly you have to constantly prepare reports. This means you have to hire someone who knows to make reports using Word Processor. Keeping proper record of all the data related to your business is also important. You have to hire another person for this. Now all this can be done easily by hiring a single skilled Virtual Assistant who specializes in these jobs. Proofreading is the art of correcting documents which have typological errors. Your report also needs to be of a perfect size not too long or not too short. It has to be edited. When you need to submit reports or proposals you need to be sure that there are no errors in it. All these mean that you need a professional who can write your documents flawlessly. A Virtual Assistant who specializes in this work will do this for you. When you are running a business or have an important job you end up spending a lot of time writing official letters. Then there is the task of creating forms for different purposes. You may also have to prepare many reports regularly. On top of this you may have to make charts and tables for using at various meetings or for your employees. If you hire an employee to save yourself from these problems then you again have to take the responsibility of a permanent employee. All you need is a Virtual Assistant who will take care of all these assignments and make your job easy. Sending mails or replying to mails is an intrinsic part of any high profile job. Then there is the added responsibility of emails. When you also have to handle faxes then you really feel the pressure. Now save your time and energy by simply hiring a Virtual Assistant. Portable Document Format is a file system which is used widely in the present world. If you do not know this then you will need someone to get this job done for you. The best option is to hire a Virtual Assistant to take care of converting documents to the PDF format. 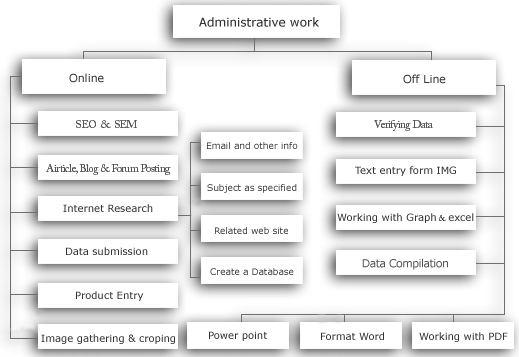 If you need to design spreadsheets take the help of a Virtual Assistant. Your VA will create a spreadsheet and also update it whenever necessary. To run your business without any hiccups you need to maintain all your data in an organized way. This means you need your own database. A skilled Virtual Assistant will help you by maintaining your database and doing updates whenever you need. In this competitive world you always have to be aware of whatever is going on around you. This means that you constantly have to search the internet to find about all the latest happenings. The only problem is that it will take up a lot of your time. Now you can relax while your Virtual Assistant keeps an eye on the internet. Meetings and conferences are incomplete without PowerPoint presentations. Hire a Virtual Assistant and wow everyone with exceptional presentations. Creating slides is easy but making impressive slides is not. If you take the help of a Virtual assistant who is an expert in this field then you can get great quality slides with ease. When you need a vendor your Virtual Assistant will help you to locate a good one so that you get the best deal. Before you place an order you have to collect quotations, go through the details of each and everyone before you finalize someone. This is a complicated process and needs a lot of time as well as attention. You can get this done without any hassles by hiring a proper Virtual Assistant. If you have to meet lot of people then it is trouble maintaining the schedule of appointments. You also have to be careful that you do not give the same time slot to more than one person. If you get a Virtual Assistant to handle your appointments then you will be able to save yourself from a lot of stress.